Scientists observed impaired lysosomal protease activity in cells from people carrying the GRN mutation. A new study published in Science Translational Medicine shows that a neurodegenerative syndrome in older adults called frontotemporal dementia (FTD) shares several fundamental features with a different neurodegenerative disease usually seen in children, called neuronal ceroid lipofuscinosis (NCL). Both of these diseases are caused by mutations in the GRN gene, with FTD occurring with only one functional copy of the GRN gene, while NCL, a lysosomal storage disease, occurs with mutations in both copies of the gene. Through imaging techniques and analyses of postmortem tissues, the scientists demonstrated that NCL-like features could occur in some patients with FTD, before dementia onset. Marsel Mesulam, MD, director of the Cognitive Neurology and Alzheimer’s Disease Center and chief of Behavioral Neurology in the Department of Neurology, and Eileen Bigio, MD, Paul E. Steiner Research Professor of Pathology, were co-authors on the study. The scientists used non-invasive retinal imaging of living pre-symptomatic adults carrying the mutation. In this group of carriers, the scientists found preclinical retinal degeneration including lipofuscin (lipid-containing residues) deposits and retinal thinning. Furthermore, by analyzing postmortem tissues from patients with FTD, they found increased lipofuscin deposits and NCL-like storage material deposits. The scientists also studied two types of cells from carriers of the gene, lymphoblasts and fibroblasts. 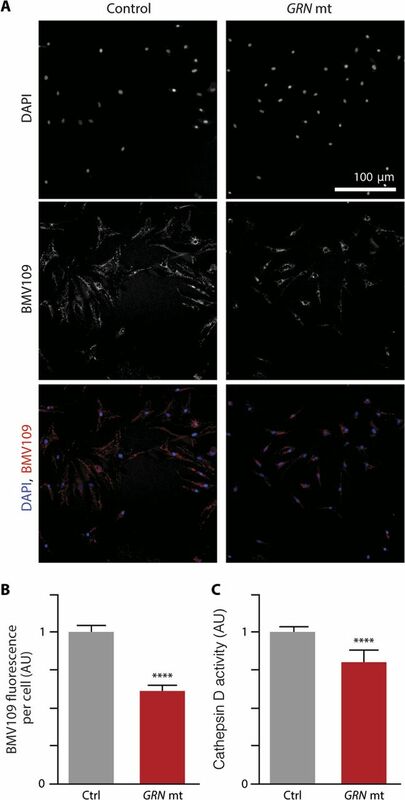 They observed accumulated NCL-like storage material in lymphoblasts and impaired lysosomal protease activity in fibroblasts. According to the scientists, these findings indicate that only one functional copy of the GRN gene in patients can cause accumulation of NCL-like storage material and early retinal abnormalities, suggesting that these lysosomal dysfunctions represent the same disease processes in both FTD and NCL. This study was funded by National Institutes of Health grants K08EY023610, R01AG036884, R01AG051390, R01NS098516, AG023501 and AG19724; Bluefield Foundation, American Brain Foundation; That Man May See grants AW141505 and AW121324; Research to Prevent Blindness; National Eye Institute grants PAR 13-269; Consortium for Frontotemporal Dementia Research; VA Merit Awards I01 RX002133 and I01 BX001108; National Institute of Neurological Disorders and Stroke R01NS073813; Alzheimer’s Disease Center grant P30 A.13854 and P30 AG13854; Philippe Foundation; and National Multiple Sclerosis Society grant FG 20102-A-1.